Your watch is the essential accessory that no man is complete without. An item you wear practically every day, your watch is like an extension of yourself and as such, must be perfect. 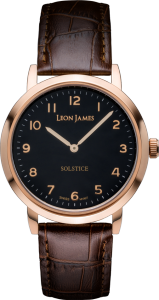 When it’s time to choose a new timepiece you should, of course, choose something that’s stylish and functional. 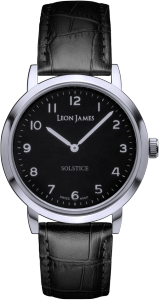 Solstice by Leon James is a bit of luxury, your perfect watch to match your personality. 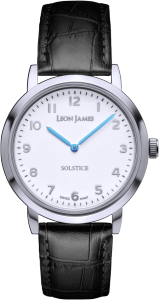 The Solstice reflects simplicity of form, its hand-applied polished numerical markers and faceted hands are adorned by a deep casing that speaks of substance. The range is emotive. 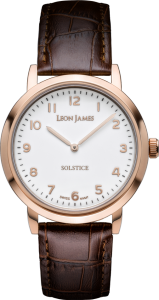 The rose gold, its warmth and sophistication, a perfect accessory for the more formal occasion. The silver finish, fresh and contemporary, for when the sun is out. The white with its blue hands, a hint of playfulness. All our watch cases feature a mix of carefully brushed and polished finishes, both capturing reflections beautifully. Paired with curved lugs, hand-applied polished markers and faceted hands, they produce a stunning silhouette full of surprises – including a wondrous play of light.  Leon James watches are perfectly presented in a polished piano black box protected with a velvet inlay and outer box embossed with the Leon James crest.